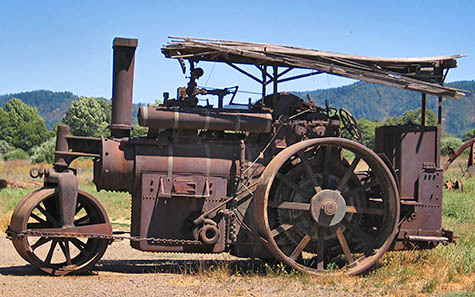 At the October, 2014, Roots of Motive Power board meeting, we decided to move the Kelly Springfield roller from Roots of Motive Power in Willits to Baldo Locomotive Works in Willits. The move began a mid-week work party to begin its restoration. Work parties have been gathering on Wednesday evenings, from 5 to 8, or so. Baldo Locomotive Works is enclosed, offering heat and light to restoration workers. This shoud help speed the restoration. What follows is similar to a journal. It’s a work in progress about a work in progress. The material so far comes entirely from email correspondence, mostly from Chris Baldo to a fairly large group of Roots members. Dirk Johnson is putting this together with an eye toward reaching a broader audience for the important work at Roots of Motive Power. We hope it will also add some buzz and excitement for a project that already sizzles. If you find it difficult to attend the Roots weekend work days, this is an opportunity for you. This project has many facets so there is something for everyone to do regardless of skill or expertise. There’s wood working for a new canopy, boiler work, cleaning and painting, and historical research, to name just a few of the areas that need a lot of work. If you would like to participate in any way that wouild suit your skills, drop us an email to get the work location and let us know you’ll be joining us. We might tear it apart and find the boiler needs more work than she is worth, but that is the gamble in any steam restoration. Attached are a few photos, one of the current condition and some of a similar Kelly Springfield in Mt. Pleasant, Iowa. The influence of Kelly Springfield’s British engineer are apparent.